It’s brand-planning season in Pharmaceutical industry and therefore a useful time to reflect on how this foundational process can be enhanced to better serve us to deliver on the promises of “customer-centric” and “multi-channel” communications. The typical Pharmaceutical brand plan does a good job of establishing a brand-centric strategy for the brand. The precise elements vary but an average plan includes a brand situation analysis, including a SWOT, competitive analysis and issues summary. It includes the brand’s positioning, key messages, basic customer segmentation and targeting, strategic imperatives for each functional area, and key performance indicators. Finally, most plans include a section listing tactical initiatives, timing and budgeting information. As illustrated below, what’s usually missing or sparsely covered is a customer engagement strategy section to provide a bridge between the brand strategy and tactics. Most brand plans typically jump straight from brand strategy information to information about discrete tactics in various categories. Skipping the customer engagement strategy step typically results in negative symptoms that ultimately hinder the quality of the customer experience a brand delivers. You may recognize some of these symptoms in the table below. In the old days when brands interactions with physicians were unencumbered and limited to reps, medical meetings and journal ads, the need for a customer engagement strategy was less important. However, in today’s world of multiple customer groups, mounting access restrictions and numerous channels and content formats, customer engagement strategy has become an essential discipline for commercial leaders. The annual brand planning process provides an excellent opportunity for brands to fully articulate the customer experience they will deliver to each customer group and how it will advance brand objectives and fulfill customer expectations. To bridge the gap between brand strategy and effective experiences, we have worked with Pharmaceutical commercial teams to embed a customer engagement-planning module into their standard brand planning process and calendar. As illustrated in the table below, the module includes elements that can be added on top of the traditional situation analysis and brand strategy pieces. These elements should be included for each discrete target customer group (e.g., physician, patient, nurse, IDN, etc). From a calendar point-of-view, the situation analysis steps should be completed or near complete before brand planning begins so the foundational knowledge is in place. 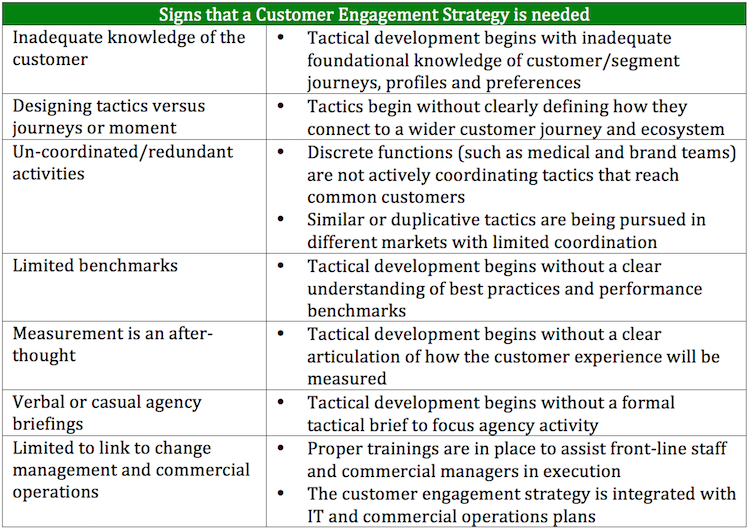 Next, time should be allowed for customer engagement strategy work to occur before the final tactical plan and budget is in place. Additionally, time should be budgeted to allow discrete functions to work on integrate their customer engagement strategies into a cohesive solution that reflects how customers will experience the brand (vs. “siloed” functional plans). To make this happen, brand and medical leaders should assign accountability for discrete plans per customer group. We have identified four levels of maturity related to customer-centric brand planning as illustrated in the figure below. The majority of Life Sciences companies are at level 1, making the transition to level 2, which as been described above. A few organizations are making the shift from level 2 to level 3 where companies move brand-centric organizational structures to look organize around customer group and create plans that ensure a cohesive customer experience for common customers across a multi-product portfolio. These companies have created a customer engagement function to drive this outcome. Even fewer have advanced to level 4 to develop solutions for customer groups that span disease areas. For the majority of companies at level 1, the brand planning ritual offers a useful opportunity to start getting better at customer engagement strategy by embedding this discipline planning processes along side traditional brand planning activities. Taking this step will drive noticeable change in the quality of plans quite quickly. From there, senior leadership should think about how to tune the organization to take on a more sophisticated and encompassing approach to customer-centric planning. Finally, it’s worth remembering the annual planning process is a start but ultimately we should strive to manage customer experience as an ongoing, data-driven and and iterative process of improvement.